In Part 1 of this interview we got know Kapfenberg, its ancient and recent history and how the idea for the world record-setting lipdub came about. 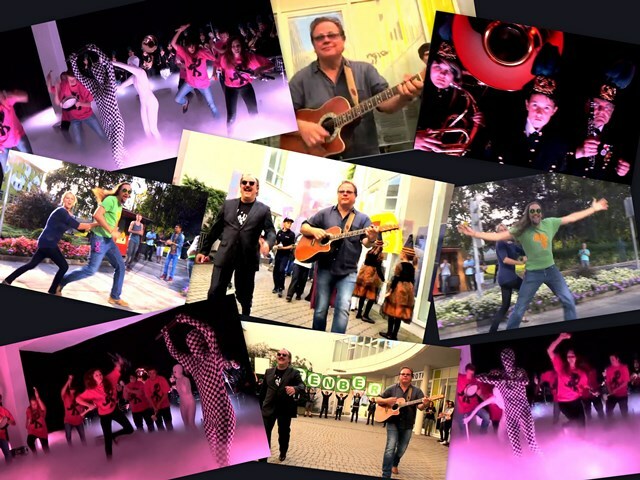 In Part 2 of this interview we are now continuing our interview with Markus Kamper, the city’s marketing expert, and investigating the actual creation of the lipdub. Organizing more than 6,000 participants and 110 groups, as well perfectly choreographing the event was a true logistical triumph. Have a look now at how this lipdub came together. More than 6000 people participated in the event, that’s more than one quarter of the entire population of your city. This does not even include the spectators. How did you get so many people involved? Please talk to us about the planning leading up to this record setting event. We started planning the lipdub about one and a half years ahead ot time. One of the real challenges was how to educate people about what a „lipdub“ really is. So we went out and visited many of the city’s sports clubs, associations, institutions, schools and even private individuals at home and told them what was going to happen on September 19, 2014 in Kapfenberg. What made this process easier was that we had a very good lipdub to show to people, the one done in Grand Rapids, Michigan. Going on Youtube and showing people this lipdub made it so easy for us to convince people to participate in our special event. After they had watched the lipdub for a few minutes we did not need to explain it any further and people became very enthusiastic about the project and wanted to be a part of it. And as a thanks to Grand Rapids, Michigan, for giving us such a great example to follow, we built in some special messages to them in the lipdub as well. Please tell us about the day of the lipdub, September 19, 2014. Did you have any rehearsals? Did you make any changes to the schedule as the day unfolded? What about the logistics of creating this event on this action-packed day? The rehearsals started about 6 weeks before the actual lipdub. We invited the groups to be at their positions at a certain times and we went through the scenes with them. Timing and choreographing this story-telling lipdub was really a huge challenge and achievement. Our residents could also contribute their ideas and once the storyline was developd our directors showed them exactly what to do. On September 19, 2014 we did four takes of the lipdub itself. Let me add that it had been raining essentially for weeks before this day, and somehow, miraculously, the rain clouds opened up on this special day and we had perfect blue skies and sunshine. Evyerthing just came together magically! Even the Imperial Couple were part of the lipdub! At 12 noon was the last rehearsal before the actual recordings. After that we completed three takes of the 14-minute lipdub, at 1:30, 3:00 and 4:30 pm. We had a few glitches in the earlier takes but the last take at 4:30 was absolutely perfect. We could not have asked for better timing and logistics. Everything came together for us and the last take could not have been any better. One important detail of the event was that Austria’s second largest radio station, Antenne Steiermark, played the song live four times over the radio, and all the participants and spectators of the lipdub could hear the new 14 minute version of „LIVE IS LIFE“ on the radio as the lipdub was being filmed. 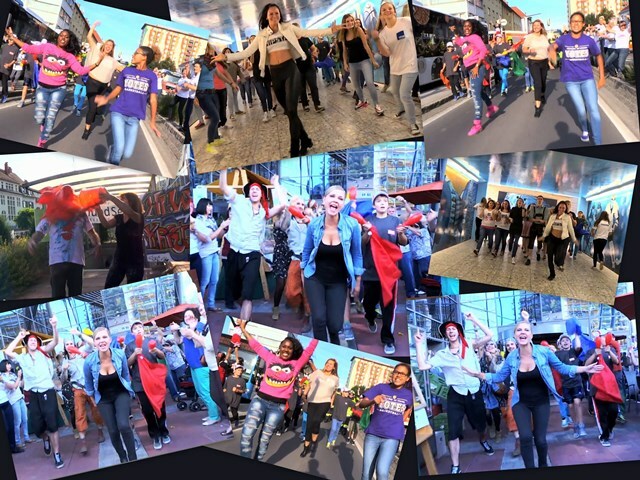 The fact that the song was being played on big loudspeakers throughout the entire town made it possible for everyone to perform their part at the right time and the humorous storyline of the Kapfenberg lipdub unfolded with flawless choreography. During the first three takes we changed around some of the groups every time and made changes on the fly. Everyone was flexible, participated with excitement and had great fun in this huge street party. Naturally, from a logistical point of view, such a huge event presented a bit of a challenge for the city. We needed to close several main streets for many hours. 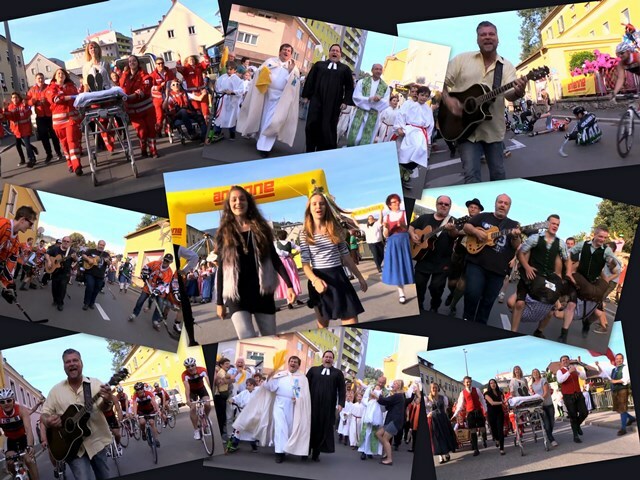 To make this a true mega-event we had 20 bands playing all day on seven different stages, and organized a huge party for our children in Kapfenberg’s soccer stadium. 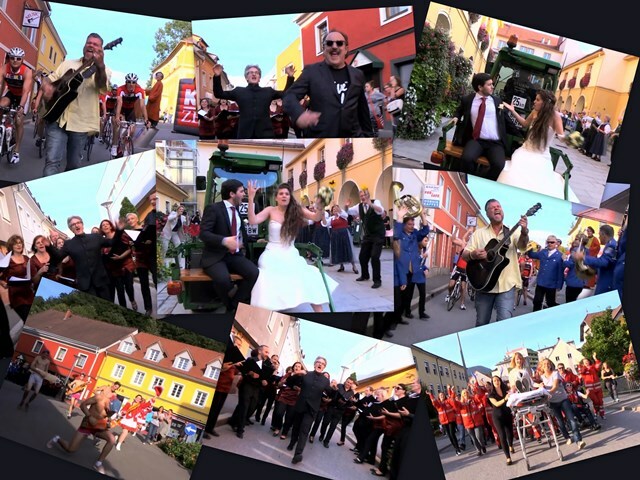 The Kapfenberg lipdub was the biggest event the city has ever organized. I still get goosebumps thinking about that special day – walking through the city, watching the people and their enthusiasm in between the lipdub takes. The atmosphere was absolutely electric! People of all ages were smiling and dancing the entire day! What is fascinating about this lipdub is not only the number of people that participated but also the fact that the video was shot in one single take, at more than 14 minutes creating the longest lipdub in the world. What kind of groups and individuals participated in the lipdub? The lipdub truly represents all the people that live in our city. Our participants came from every age group and every walk of life – we had everyone from kindergarden children to retired people. 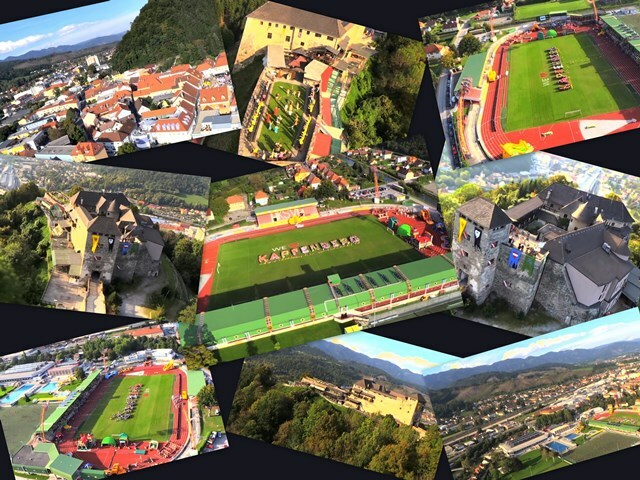 Sports and social clubs from all over Styria joined in and registered to participate as well. We even had a new-born baby in the video – watch the scenes with our pastors and you’ll see one of the priests hold up a tiny little baby. These are the real priests of our town! Everything you see in the video is real and if you come to visit us you will recognize and meet some of the people that you saw in the lipdub video. Everybody in the video is an absolute amateur… There is not a single professional actor in this video. The local ambulence, three priests and a newborn baby are also part of the lipdub! Please tell us about the camera work and the helicopter flight that were part of this huge event. We’d also like to know more about the final scene in the soccer field. A helicopter flight was part of the plans for the lipdub right from the beginning. Pilot Thomas Eder from Helicopter Tours Austria was the expert who made this perfectly choreographed aerial performance possible. Camera man Joe Dipold did a fabulous job of creating one continuous and smooth shoot of entire event and he did so walking, riding on a small tractor or on a scooter, and of course, flying in a helicopter. And producer Wolfgang Pust took care of all the details and even pulled our camera man into the helicopter using a harness. The filming and the production of our lipdub was a carefully planned and perfectly executed feat of multi-media creativity. Showing Kapfenberg from the air was really important in telling the story of what our city stands for. Kapfenberg is embedded in the gorgeous green mountains and scenic landscapes of Styria, the province that calls itself „the Green Heart of Austria“. And Kapfenberg is also a sports city with professional teams in soccer, basketball and ice-hockey, not to mention the dozens of amateur sports that are played in the city. The final scene of the lipdub was emblematic of the entire event: we had assembled more than 1500 children and students who came together in our state-of-the-art soccer stadium and formed the phrase „WE LOVE KAPFENBERG“ which created the picture-perfect ending for our lipdub. The kids coming together was the real highlight of the entire video! Mayor Wegscheider and his team are celebrating and OPUS is playing live on the main square! The Lipdub was a full-day event and included a huge street party. What about the festivities and celebrations that were part of the Lipdub? 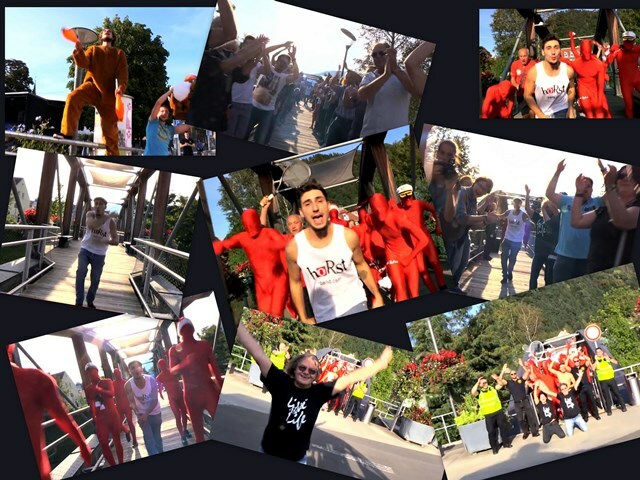 The preparations for the lipdub started long before the event and the party itself started at 11 am on September 19, 2014. We had set up seven different stages with more than 20 live bands and organized a huge all-day party for the kids in our soccer stadium, complete with inflatable slides and event stages. To keep everyone well fed we put together 6,000 lunch packages for everyone who participated in the lipdub. So you can image that this was a massive all-day party that took weeks to organize. 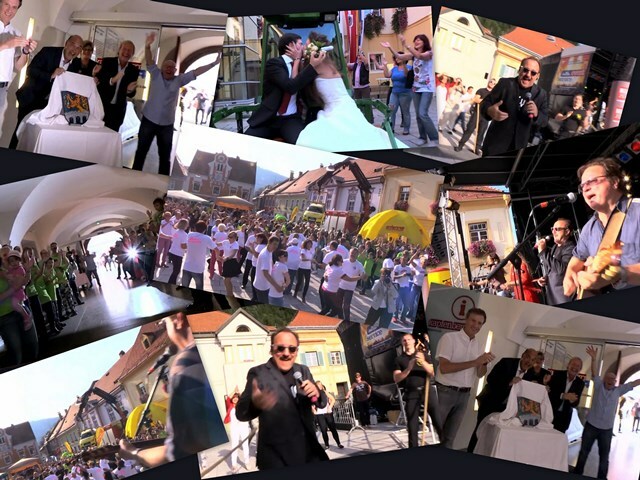 In our media releases we communicated that OPUS would perform a live show at 8 pm on our main square to thank everyone for being part of the show. At 9 pm everyone was informed that the lipdub would be released on Youtube and that it would be shown at the same time on a giant screen on Kapfenberg’s main square. We had even set up a second screen near the main square to make sure that people would be able to watch the video and the OPUS concert. The crowds were so large that many people simply could not make it onto the main square any more. Setting up the second screen turned out to be a great decision because more than 2,500 people were able to watch the lipdub video in the evening, after having earlier spent more than 10 hours in the streets. Lukas Maierhofer, of the bands Tschebberwooky and Horst, delivers the final vocals. Kapfenberg has great musical talent. 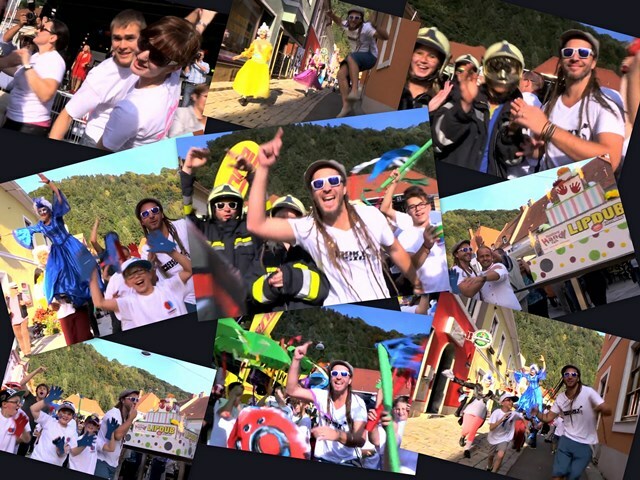 What effect has this lipdub had on the citizens of Kapfenberg and the overall sentiment in your city? When you walk through the streets and ask any citizen about he lipdub everybody will tell you their very own personal highlights of that special day. The city of Kapfenberg has created something truly unique and new, and everyone worked together to pull it off. The lipdub has really changed the way we see our city. Now we are proud of our project and of our city and we want to share its beauty and that of the surrounding region with the world. A helicopter flight shows off the city and 1500 kids form the letters to „We ♥ Kapfenberg“, all part of the longest, and probably the most creative and funnest lipdub ever made. Thank you, Marcus, for telling us about how this amazing event came together. 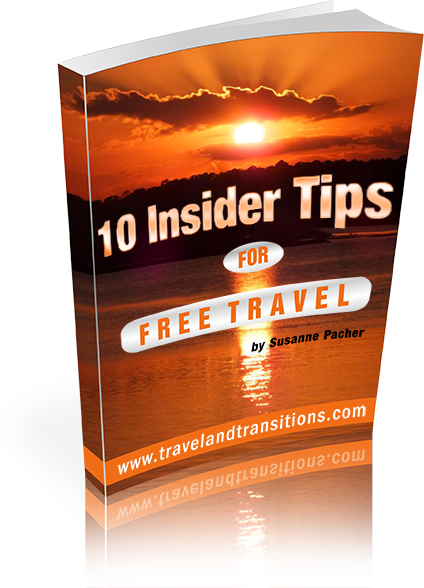 In the next part of the interview, let’s talk a bit about the tourism opportunities in your home town of Kapfenberg.